Find your perfect neighborhood and home. The longer you stare at this abstract masterpiece, the more you notice. The rectangles meet with triangles which overlap against circles that come back around to join the rectangles, all of which meld together without ever losing form. Different shades of red, blue, green, and yellow draw your attention to each individual polygon, but also form a sense of cohesion when you take a step back. It’s a beautiful work of art worthy of your consideration. No, we’re not standing in some stuffy art museum admiring the works of a long-dead artist. We’re high above Kinloch Park in Kinloch, Missouri, which borders Ferguson just outside of St. Louis. What we’re looking at is a basketball court. Three basketball courts, actually. And it wasn’t that long ago that all three were in a state of decay and disrepair. 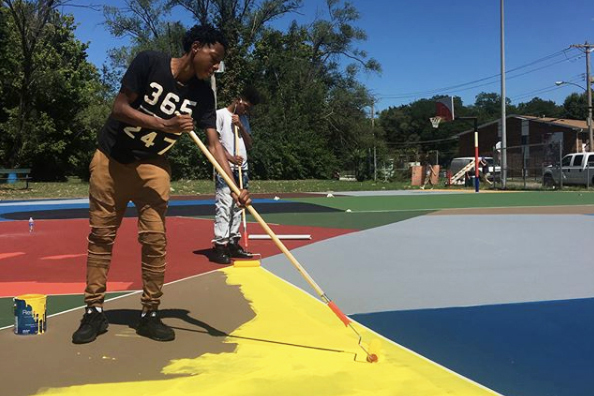 That was before Project Backboard founder Daniel Peterson and painter William LaChance got their hands on the 20,000-square-foot court. The 175 feet slab of concrete, which is bigger than the Sistine Chapel ceiling for those keeping score, was transformed from a rundown block of asphalt pocked with cracks and weeds into a work of art. A work of art with six basketball hoops and a three-point line, but a work of art all the same. 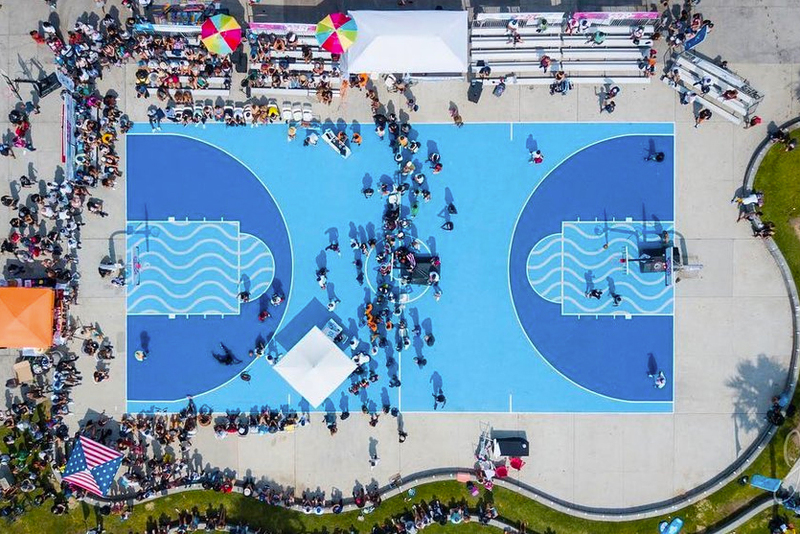 "We intentionally designed the basketball courts to have these really enormous fields of color," LaChance told the Riverfront Times in 2017. "We were kind of thinking ahead to when people will be using the basketball courts and be playing ball on them. Potentially when the players or onlookers are [watching the game] they're actually completely surrounded by singular colors." Looking down at the Kinloch Park court now, it’s no wonder it was recently named one of the best designed basketball courts in the world by Vogue. 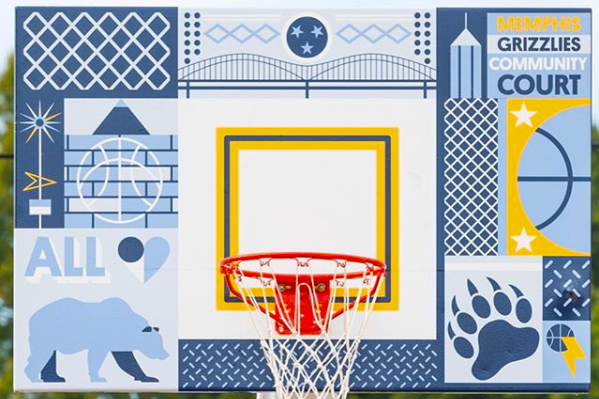 Ironically, artwork wasn’t even in the equation when Peterson started Project Backboard in 2014 as a “parting gift” to Memphis, the city he’d lived in while working for the NBA’s Memphis Grizzlies. From there, Peterson kept finding more local basketball courts to fix up. The real game changer didn’t happen until he started working on the dilapidated court at Pierotti Park. And that’s what he did, creating a finished product that you couldn’t miss, highlighted by deep pink and cobalt blue paints to demarcate the key and center circle. “It made it really clear to me that the artwork could be a really important piece in terms of activating the space,” said Peterson. Taking a step back for a second, what’s so important about a fancy-looking basketball court? The United States is littered with basketball courts. Tons of them. Depending on where you live, your neighborhood probably has at least a handful of them, often sitting empty until the next pick-up game breaks out haphazardly. Peterson sees basketball courts as more than just a place to play a game. To him, they’re a place where a kid first learns what it means to be a part of a community. If you can make a basketball court into something bigger, more important than just a slab of concrete with two hoops on each end, then you can create a sense of community that didn’t otherwise exist. And that is what’s so important about a fancy-looking basketball court, according to Peterson. Peterson says that one important extra step he takes with every new project is handing out posters of the artwork that will eventually be painted on the court. In theory, someone takes that poster home and hangs it on their bedroom wall. They take on a sense of pride knowing that’s their home court. So the next time they play a pick-up game on it, they’re not as likely to throw their soda can or Gatorade bottle on the ground. Instead, they might spend a couple extra minutes picking up chip bags and candy wrappers in order to keep their court clean and take ownership of something in their community. And for Peterson and Project Backboard, it really is about instilling the notion that this is your court. 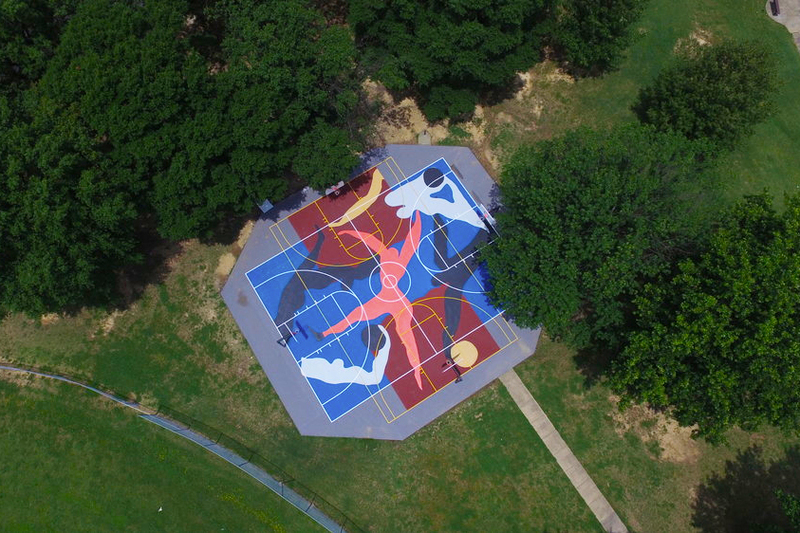 He almost always works with a local artist on each court, asking them to create a design (or submit one they’ve already done) which he then puts a grid on top of. From there, Peterson uses construction chalk lines to create a grid on the court surface. Then, he draws a design outline on the court, having the artist double check to approve everything once he’s done. While fine details and shading can often be hard to replicate, the finished product is usually close enough to the initial design that few would even notice. 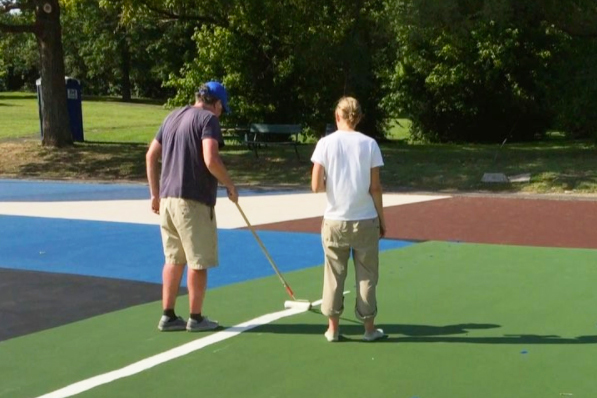 A large part of that has to do with the hard work that volunteers put into helping get each court in game shape. Peterson always lines up a collection of volunteers to help out beforehand but can almost always count on “impromptu volunteers” showing up as well. While working together and collaboration are the heart of what Peterson is trying to accomplish with Project Backboard, ultimately he hopes that it will morph into something inspirational that doesn’t always require his hands-on work. Project Backboard will get a chance to show itself off during NBA All-Star Weekend as part of the Show LA Love event in Venice that runs from February 14 to 18. A slew of parties, clinics, and basketball tournaments will be hosted on the beachside teal and purple court. For Peterson, it’s another feather in his cap but he’s not stooping to put that cap on just yet. He hopes to be able to paint the other three Venice courts nearby soon. Even if he gets to do that, it probably won’t be enough to stop the momentum. While he considers all of the courts to be his “babies,” the bar is currently set by the one in Kinloch. The extra special touch is that the court is practically adjacent to St. Louis Lambert International Airport. Peterson said that when he was leaving St. Louis, he looked out his window and could see the court below, a colorful beacon in a sea of browns, greys, and greens. It’s a nice bonus. But perhaps even that pales compared to the effect that court will have on the surrounding community. It’s an effect that started taking place even before they were finished remaking it.